can i get away with a cheap chinese supply ? e.g. False economy ? - Any recommendations ? I really don't see how they buy in all the part for that money JS! A decent 12V 2A wall rat has got to be 5 to 8 quid? In fact it is SO cheap I would suspect its electrical safety. There was a review of a really good, fully isolated supply in SoS about a year ago? Will try to find it. Pricey mind but should last a lifetime. Over at a forum called "thefretboard" I read constantly of peeps having hum loop problems and instabilities with various supposedly 'isolated' PSUs, seems an area where it is wise to spend a few bob (and yes I DO see "Yorkshire" up there!). I have a 'Harley Benton PowerPlant' from Thomann. It doesn't claim to be isolated but has worked well for a few years now. I have had no hum issues and I like that it has a proper IEC mains input. The general rule of thumb is that all digital effects should be run from either their own PSUs or from a suitable isolated output on a multi-way effects PSU. I have a 1SPot, but some pedals do not like it - mainly the battery only ones I have, like the early Roland pedals. It runs the majority of my pedals fine though, a mix of some MXR, Boss, Sansamp and wahs. I’m using one of those cheapy PSUs, and it’s fine for my board - tuner, eq, overdrive, delay, reverb, sansamp. Been using it a couple of years no problems. But you’ve got more pedals. It claims the outputs are isolated but I’m pretty sure they’re not. There’s something on tinterweb about this. I haven’t had any noise problems though. Richie Royale wrote: I have a 1SPot, but some pedals do not like it - mainly the battery only ones I have, like the early Roland pedals. It runs the majority of my pedals fine though, a mix of some MXR, Boss, Sansamp and wahs. 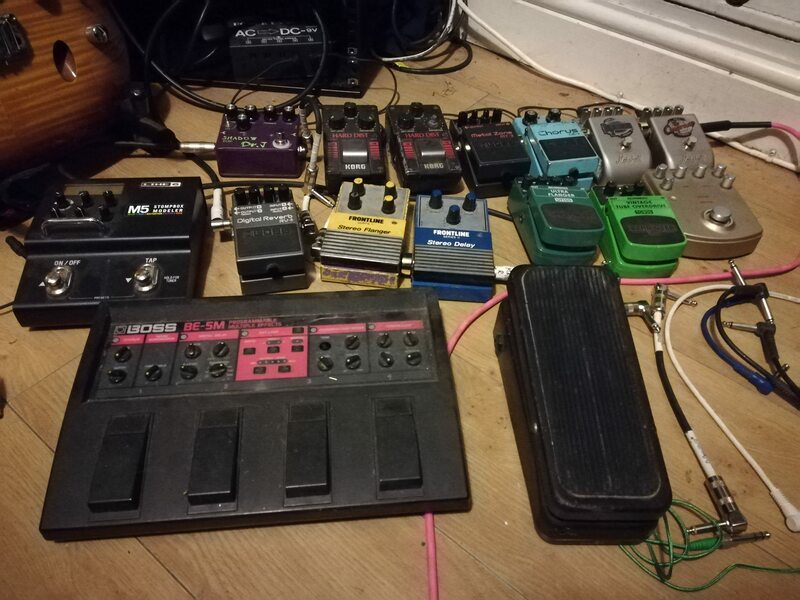 It might be worth checking the polarity of the battery only pedals, most likely they have the earth side reversed (modern pedals are usually centre negative with the positive grounded, if your battery only pedals have the negative side of the DC supply grounded that would usually cause noise). ef37a wrote: it is SO cheap I would suspect its electrical safety. My thoughts too - I want to spend as little as possible - but not at the expense of wiping out my pedals (or myself)! ef37a wrote: I read constantly of peeps having hum loop problems and instabilities with various supposedly 'isolated' PSUs, seems an area where it is wise to spend a few bob (and yes I DO see "Yorkshire" up there!). Line 6 M5 has it's own 500mA supply (consumption is 350mA) so will probably keep this one separate. btw http://stinkfoot.se/power-list I found this site is very useful for working out power. Sam Spoons wrote: I have a 'Harley Benton PowerPlant' from Thomann. It doesn't claim to be isolated but has worked well for a few years now. I have had no hum issues and I like that it has a proper IEC mains input. BigRedX wrote: all digital effects should be run from either their own PSUs or from a suitable isolated output on a multi-way effects PSU. this is looking tempting - if I can justify price..
adrian_k wrote: I’m using one of those cheapy PSUs, and it’s fine for my board - tuner, eq, overdrive, delay, reverb, sansamp. Been using it a couple of years no problems. Feels less painful to spend money and get a tuner - but possibly isn't a great PSU - false economy? As usual, asking a question on the forum has focused my mind on things I should have thought about earlier!! I think I need to decide what I really need from my pedals. Whilst it would be fun to have everything mounted and a full choice in the studio, maybe I need to set up as smaller more practical 'live rig' and keep 'the spares' for additional colour when needed in the studio. But I am sure I saw a review of a pedal PSU in SoS a year or so ago? More outlets than that Mission and 18V iirc. I am sure there was a gutshot showing the multiple traff winding for the truly isolated outputs. Bugging me now! Will have to wade through 2007's mags. Thanks Sam. I've only got two and I'll probably just leave them on battery power as they are not frequently used. Paul White reviewed an isolated supply from Nemphamis in April 16 ; pricey though at over £200. Recently purchased one of the Voodoo Labs offerings which covers absolutely everything I need , not cheap either , but guitarguitar had a good price at the time and probably one of my more sensible purchases in years. I'm a bit out of touch these days, but what is the actual current demand for modern pedals? The reason I ask is you can get 9V regulated, isolating DC-DC converters at about £5 for just over 200mA out or about a tenner for 500mA. So get a bog-standard 12V 2A wall wart, and hang a few of these on the end - just got to sort out the leads then. Folderol wrote: what is the actual current demand for modern pedals? Folderol wrote: I'm a bit out of touch these days, but what is the actual current demand for modern pedals? The reason I ask is you can get 9V regulated, isolating DC-DC converters at about £5 for just over 200mA out or about a tenner for 500mA. Bit fraught Will. I was once tasked to load and noise test about 10 9V rats of various brands. The difference in levels of noise and the spectra was quite wide. They all had very decent regulation and met a 1 amp rating but noise was over about a 20dB range, mostly around 25-35kHz iirc but frequency often varied with load and, rather counter-intuitively, noise was inversely proportional to load with some samples. Despite the variations, none were really bad but various makes of pedals had very different levels of line noise rejection. The point of all this rambling is, a PSU had better have exemplary noise performance otherwise CERTAIN pedals will not work well. The fact is, various brands of pedals were never designed to share both signal AND power supply paths. Those here that dabble in such things know how tricky it can be to sort out grounding INSIDE a piece of kit! Throw six or ten random pedals together? Asking for it IMHO! ef37a wrote: But I am sure I saw a review of a pedal PSU in SoS a year or so ago? More outlets than that Mission and 18V iirc. Were you thinking of the Oktopus? I remember seeing this now as well. It may well be the middle ground that I need to prevent me from either needing two PSUs or having far to many outlets on a board I'm building soon. Cheers! Wow! TWO years ago! Thanks Hugh, that is indeed the one I was thinking of. It does seem that truly isolated regulated supplies will give little trouble and that those cheaper supplies are telling slight porkies when they claim "isolated" outputs. Isolated how? Another tack occurs? Instead of an expensive custom multi windings transformer maybe a good quality 10V (say) 4 amp SMPSU line lump then a collection of DC-DC converters? These are very clean and reliable and not that expensive now. Mr Orchid, are you watching? ef37a wrote: Another tack occurs? Instead of an expensive custom multi windings transformer maybe a good quality 10V (say) 4 amp SMPSU line lump then a collection of DC-DC converters? These are very clean and reliable and not that expensive now.